… extraordinary and profoundly moving book. Mannix’s stories are told with piercing simplicity: and there is no attempt to homogenise, to iron out difficulties or even failures. A thought-provoking article, as one would expect from the deep-thinking Dr Williams, about the recent literature of dying and death. 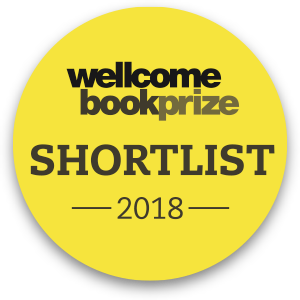 He reviews With the End in Mind, as well as Caitlin Doughty’s ‘From Here to Eternity: travelling the world to find the Good Death’; Prof Sue Black’s ‘All That Remains: a life in death’; and ‘Waiting for the Last Bus: reflections on life and death’ by former-Bishop Richard Holloway. And all, in his opinion and mine, are fine reads. Rowan William’s praise for tWith the End in Mind is personal and moving. He even hazards a guess that I am a good person. How I hope that might be true! It is not often that a book commends itself because you sense quite simply that the writer is a good person; this is one such. 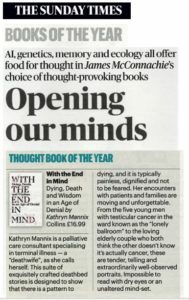 Fantastic news: James McConnachie chooses With the End in Mind as his Book of the Year 2018. He placed it first, amongst a broad selection of books intended to provoke thought and change minds. See his review and his selection of ‘Thought’ books here.